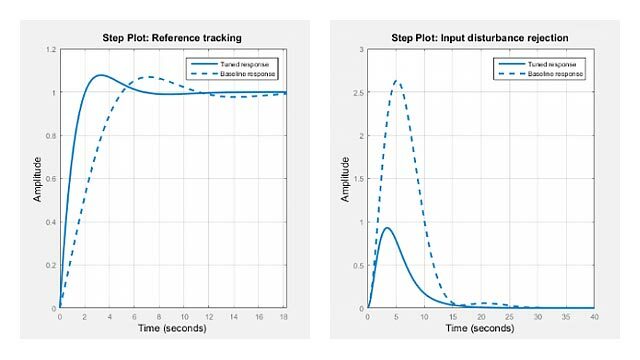 Control System Toolbox™ software supports transfer functions that are continuous-time or discrete-time, and SISO or MIMO. You can also have time delays in your transfer function representation. of polynomials N(s) and D(s), called the numerator and denominator polynomials, respectively. The tf model object represents transfer functions in polynomial form. The zpk model object represents transfer functions in factorized form. is a one-input, two output transfer function. Use the commands described in the following table to create transfer functions. Create tf objects representing continuous-time or discrete-time transfer functions in polynomial form. Create zpk objects representing continuous-time or discrete-time transfer functions in zero-pole-gain (factorized) form. Create tf objects representing discrete-time transfer functions using digital signal processing (DSP) convention. This example shows how to create continuous-time single-input, single-output (SISO) transfer functions from their numerator and denominator coefficients using tf. num and den are the numerator and denominator polynomial coefficients in descending powers of s. For example, den = [1 3 2] represents the denominator polynomial s2 + 3s + 2. G is a tf model object, which is a data container for representing transfer functions in polynomial form. Create a transfer function model for the variable s.
Specify G(s) as a ratio of polynomials in s.
This example shows how to create single-input, single-output (SISO) transfer functions in factored form using zpk. Z and P are the zeros and poles (the roots of the numerator and denominator, respectively). K is the gain of the factored form. For example, G(s) has a real pole at s = –2 and a pair of complex poles at s = –1 ± i. The vector P = [-1-1i -1+1i -2] specifies these pole locations. G is a zpk model object, which is a data container for representing transfer functions in zero-pole-gain (factorized) form.